The Aztec Empire had its capital in the city-state of Tenochtitlan and so it was the most important city of the empire. The Aztec city of Tenochtitlan was also the largest city in pre-Columbian Americas and went on to serve as the vice royalty of New Spain. The city was located on the western side of Lake Texcoco and had swampy ground. It was joined by the neighbouring city of Tlatelolco. The city itself was properly planned and divided into four parts each having its own architectural value. The Aztec city of Tenochtitlan was founded on June 20, 1325 around medieval times in Europe. The place chosen for the city was based on an ancient prophecy in the mythology of the Mexica people. According to this prophecy, the wandering Mexica people would form their city on a location signalled by an eagle eating a snake that was perched on the top of a cactus. 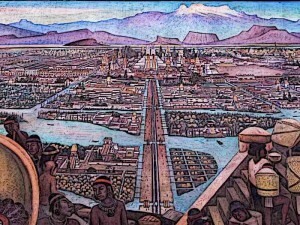 The Aztecs saw this vision on the swampy island in Lake Texcoco and thus it was here that they established their city. The Aztec city of Tenochtitlan was properly planned with a grand marketplace and many public buildings. These public buildings mainly consisted of temples, prostis, and the ceremonial centre. Important public buildings included the famous Templo Mayor which had two temples, one dedicated to the Aztec patron god Huitzilopochtli and the other one to the Aztec rain god Tlaloc. Other public buildings included the Sun Temple, The Eagle’s House, the ball game court, and various small temples. 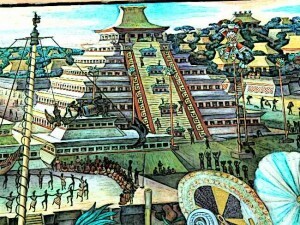 Tenochtitlan was a properly planned Aztec city and the layout of the city fully depicted it. Proper planning and layout of the city has been described by various Spanish conquistadors, in particular Bernal Diaz del Castillo. The city was divided into four zones and each zone in turn was further divided into 20 districts. Each zone had its own distinct architectural value which was reflected in the grandeur of the buildings. The city was crossed by three main streets, each connected by one of three causeways that led to the mainland. Since the Aztec city Tenochtitlan was the centre of a military empire, its rules also reflected the importance of military virtues. Additionally, Aztec society had a hierarchical structure within the population that was divided into various classes and laws reflected the privileges enjoyed by the Aztec nobility. As per the law, common people could not wear certain kinds of dress or use certain kinds of jewelry. Various other privileges were also reserved for the nobility and commoners who violated these laws were punished. There was a marketplace in all four zones of the Aztec city Tenochtitlan. In addition to that, there was a large central marketplace in its sister city called Tlateloco. According to one estimate given by Hernan Cortes, this central marketplace was twice the size of Spanish city of Seville and saw over 60,000 people trading on daily basis. Other conquistadors like Bernardino de Sahaguan have disputed this figure and given a more conservative estimate of almost 40,000 people on feast days. In addition to trading, the central marketplace also served as source of communication and news for the people of the city. The Aztec city Tenochtitlan had a complexed social hierarchy with the population divided into various classes. This class distinction was considered very important and was strictly imposed by law. The highest class consisted of the rulers of the empire and was known as “tetuhctin”. The Aztec nobility consisted of the land-owning class, the warriors, and the priests. Warriors and priests were included in the nobility because of the central importance of religion and warfare in the Aztec Empire. To become a warrior of exceptional ability was also one of the surest ways of upward social mobility for the common people. Between the nobility and the commoners, there was a class of travelling trades people known as the pochteca. These traders could amass large wealth but could not display it like the nobles. Common people indulged in all sorts of professions such as farming, military service, craftsmanship, and others. Aztec City Pyramid – The Aztec city Tenochtitlan had a complexed social hierarchy with the population divided into various classes. Aztec rulers had large and impressive palaces which were mostly arranged around an inner court. The most magnificent of all these palaces, of course, was the palace of the Aztec Emperor Moctezuma II. It was a grand palace that consisted of two zoos, one reserved for birds of prey and another one for other kinds of birds and mammals. There were over 300 people employed to take care of these zoos. The palace also had a botanical garden in addition to an aquarium. The aquarium consisted of ten ponds of salt water and ten ponds of fresh water. It housed various kinds of fish and aquatic birds. Other than the Aztec capital city Tenochtitlan, the palaces also existed in various other cities of the empire. The arrival of the Spanish conquistador Hernan Cortes changed the destiny of Aztec city Tenochtitlan forever. When Cortes first arrived with his men in Tenochtitlan, the Aztec people and the emperor believed him to be the Aztec god Quetzalcoatl who was prophesied to return according to Aztec legends. Due to this reason, he was welcomed by the nobles of the city including the emperor himself who came out of the city to welcome him. However, after the initial friendly encounter, misunderstandings developed between the Aztecs and the Spaniards when some Spanish soldiers were killed. This resulted in a declaration of war between the two and a siege on the Aztec city Tenochtitlan began. After a prolonged siege, the city was conquered by the Spaniards who utterly destroyed it and built it on new foundations later on. The Aztec city Tenochtitlan served as the capital of the Aztec Empire and was thus the most prosperous and largest city of the Aztec empire. The city of Tenochtitlan was established in 1325 by the Mexica people on the swampy land of Lake Texcoco. It was a properly planned city, divided into four zones each having its own architectural value. The island city was connected to the mainland through three causeways. The arrival of Spanish conquistador Hernan Cortes and his subsequent battle with the Aztecs resulted in the destruction of the city and its building on new foundations by the Spanish conqueror’s.